There have been a number of year-end "Charts of the Year" lists recently, see Ezra Klein's Wonkblog, The Atlantic, the BBC, NPR's Planet Money, and AEI's Jimmy Pethokoukis. But every one of these lists of charts missed what might be the biggest economic story of 2011: The new age of energy abundance in the United States, thanks to recent breakthroughs in advanced drilling technologies (fracking and horizontal drilling) that have unlocked vast supplies of previously inaccessible "unconventional" natural gas and "tight" oil from shale formations around the U.S.
Below are my six (updated) "Energy Charts of the Year" that help tell the story of the "shale revolution" that is transforming America's energy outlook, with major, positive implications for U.S. energy security, economic growth and job creation, a manufacturing revival, and even government revenues. 1. 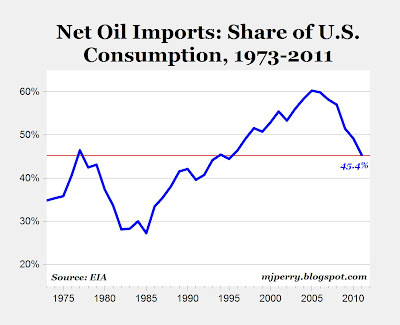 U.S. net oil imports in 2011 (through November) were only 45.4% of domestic consumption, which is down from the peak of 60% in 2005 and at the lowest level since 1995, thanks to greater energy efficiency and reduced demand, but also in large part due to increased domestic oil production (see chart below). 2. The epicenter of the domestic shale revolution is the oil-rich Bakken region in western North Dakota, which has turned North Dakota into America's "Economic Miracle State." The ongoing record-setting oil production in the Peace Garden State (see chart below) continues to make it the most economically successful state in the country, with record levels of employment and income growth, increasing tax revenues, the lowest home foreclosure rate in the country, a strong real estate market with consistently rising prices, and jaw-dropping jobless rates in many counties of the Bakken region below 2%. 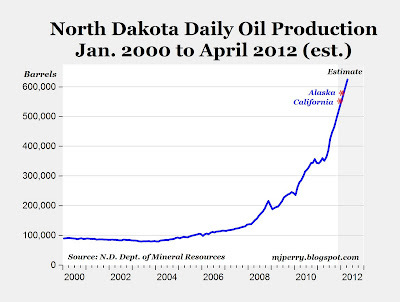 At the current pace of record-setting monthly gains in oil production, North Dakota will likely surpass both California and Alaska sometime in early 2012 to become the No. 2 oil-producing state in the U.S.
3. 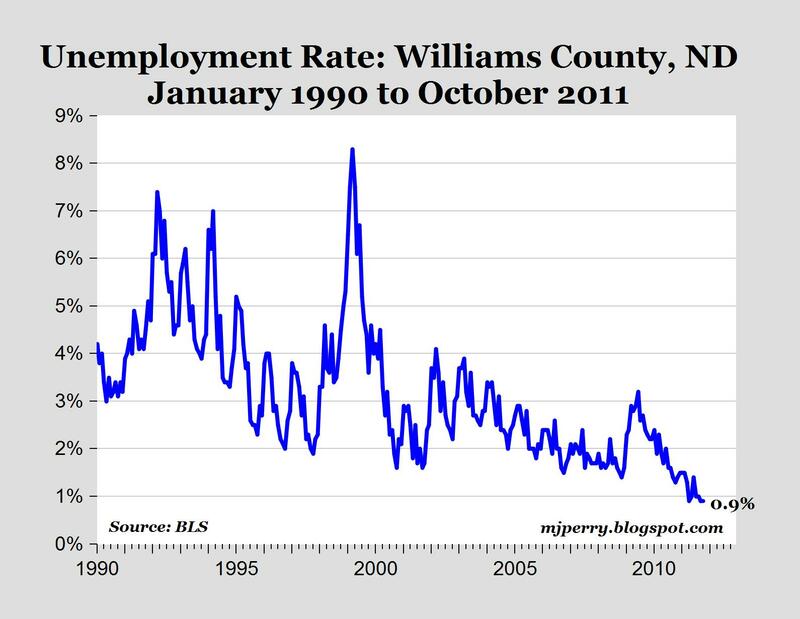 North Dakota currently boasts ten counties with jobless rates below 2% in October, but at the epicenter of the Bakken region in Williams County, home of the city of Williston, the jobless rate in October was an unbelievable eye-popping 0.9%, see chart below. 4. Moving east to the gas-rich Marcellus shale formation covering Pennsylvania, Ohio and West Virginia, the chart below shows the dramatic increases in domestic natural gas production over the last five years. After about a decade of stable gas production, the advanced fracking technologies starting becoming available about five years ago and boosted domestic gas production by almost 25% since 2006 (see chart below). The boom in unconventional shale gas made America the world's No. 1 producer of natural gas, when it passed Russia in 2009. 5. Thanks to the new abundant supply of unconventional shale gas in the U.S., we've now got access to a 100-year supply of the energy resource at the current consumption rate, and prices have dropped significantly. 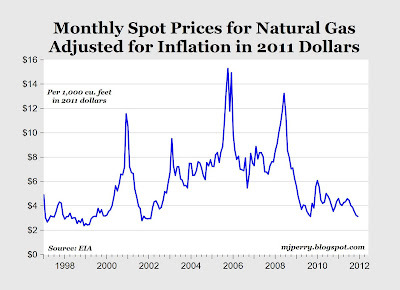 The chart below displays the monthly inflation-adjusted price of natural gas back to 1997, and shows that the current spot price of gas is close to a ten-year low, and is 70-80% below the peaks in 2001, 2006 and 2009. Additionally, gas prices over the last two years have been more stable than any two-year period since the late 1990s; so gas prices are not only close to historic lows adjusted for inflation, but are more stable than in more than a decade. It's the fact that gas prices are now both low and stable that makes it such an attractive source of energy for American manufacturers. PricewaterhouseCoopers predicts that lower gas prices will help add one million new U.S. manufacturing jobs by 2025. And residential consumers around the country are saving hundreds of dollars this winter, as utility companies in many areas have started to lower rates for piped natural gas. 6. 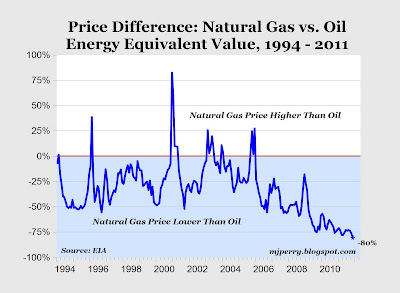 Here's another graph below (thanks to Junkyard Hawg for the suggestion) that shows the percentage difference in the historical spot prices of oil and natural gas, on an energy equivalent basis, with natural gas prices converted at the ratio of 5.8 million BTUs per barrel of oil. 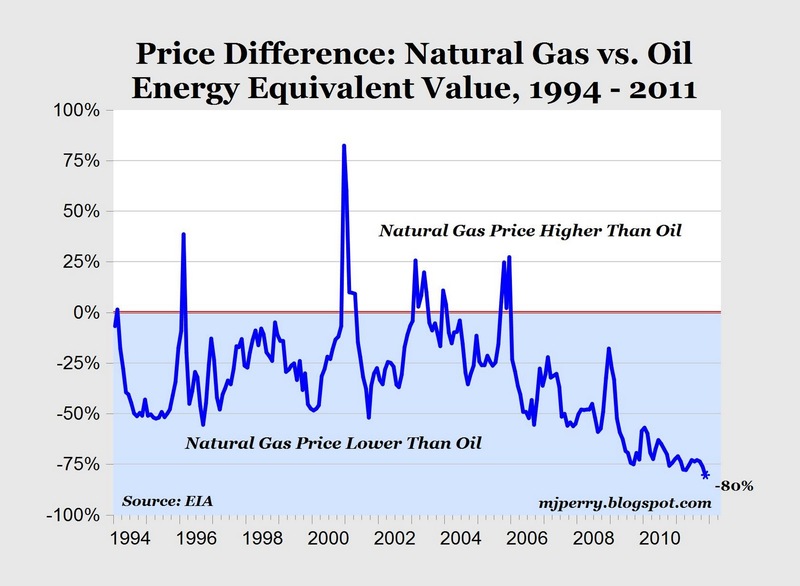 Over the last 18 years, natural gas has been cheaper than oil on an energy-equivalent basis most of the time except for fairly short periods in 1996 (1 month), 2001 (5 months), 2003-2004 (7 months), and 2005 (4 months). 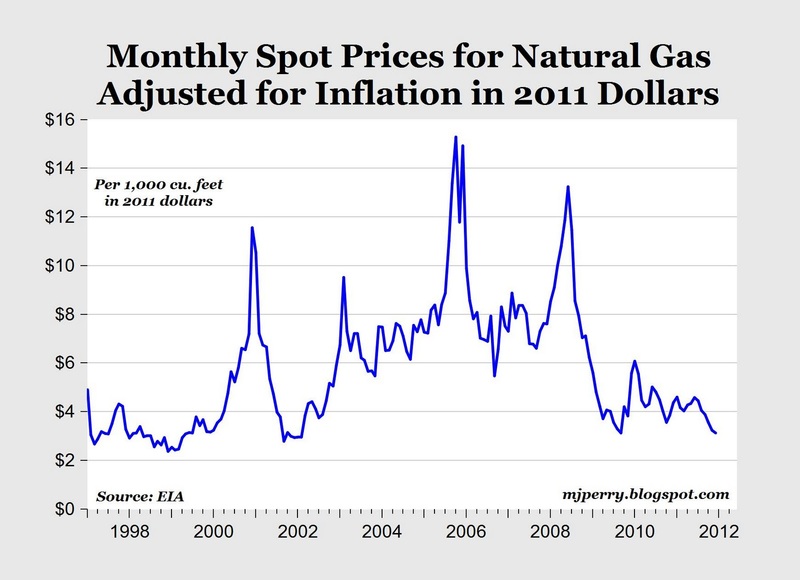 For the last 33 months starting in March 2009, natural gas has been more than 50% cheaper than oil, and in November gas was cheaper by a record 80% ($97.21 per barrel for oil vs. $18.79 for gas). Bottom Line: Thanks to the shale gas revolution, there's never been a time in recent history when natural gas has been cheaper than oil on an energy-equivalent basis. Dan anybody list one thing that President Obama and his merry band have done to make this happen? Not only hasn't Obama done anything to make it happen but he told natural gas people that he thinks this type of energy will stand in the way of the future of energy, solar, wind, etc. He looks at our energy boom as a problem not a solution. Go figure. Horizontal drilling and tracking have been around for decades. It is the price that made previously unrecoverable supplies available. Did we hire Obama to drill oil? We didn't hire him to stop it. These are beautiful charts, that are very positive for the enduring and slow growth economy. Energy, Exports and Manufacturing are the surprising, to many, areas of U.S. economic strength going forward through 2012. We need to get something straight, shale oil is no substitute for conventional oil. It has a much lower EROEI (energy return on energy invested) ratio than conventional oil and the production follows a very quick depletion curve. As long as oil is at or near $100 a barrel these field can produce...for now, but at $100 our economy struggles to grow. I see fossil fuel gluts in five to 10 years--depending on the actions of thug states, such as Saudi Arabia, Venezuela, Russia, Nigeria, Iran, Iraq, Libya etc. At $100 a barrel, demand will slowly decline, and supplies will be abundant. Most oil states are run by monkeys, so the supply of oil is ever precarious. Even so, with 50 mpg cars and shale oil, and GTL and CTL, the future looks bright. The Chevy Volt is considered a dud, but that is only because oil is so cheap. At $6 a gallon, people will buy the Volt. BTW, the nation that thrived through the recession was Canada. I assume this was not due to their commie-socialist government, although maybe better government reg of banks helped. I assume it was oil sands. Does anybody know? France and Canada pretty much dodged the bullet. We got clonked, but our productivity has risen, an interesting development. 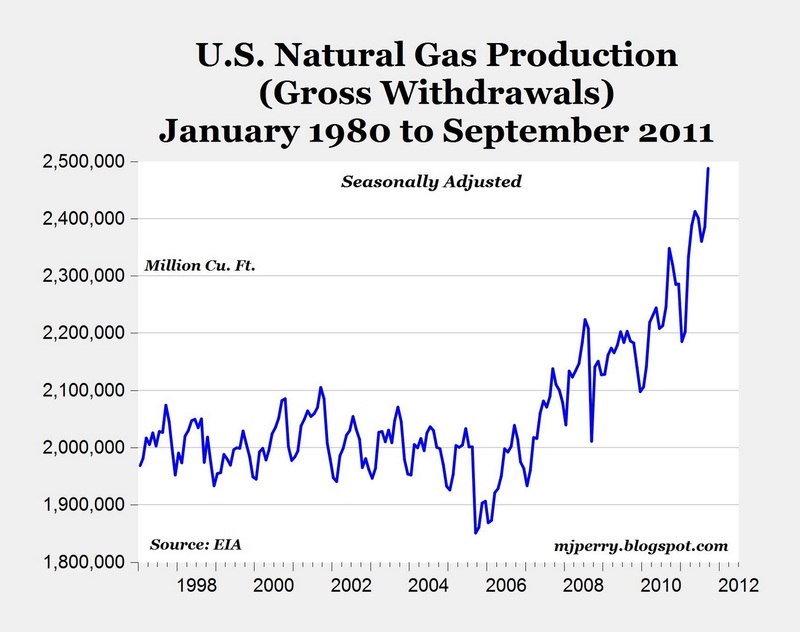 Re Obama and natural gas---seems like he is a big fan of natural gas. Secy Energy Chs likes the nukes. Probably the suggestion that Obamam is "against" natural gas is just a right-wing canard. President Barack Obama promoted natural gas in remarks at Georgetown University on Wednesday. WASHINGTON — T. Boone Pickens has spent much of the past three years campaigning for a single candidate: natural gas. President Barack Obama yesterday announced a plan to cut U.S. oil imports by a third by 2025. Once again we have Mark missing or ignoring the fact that the shale industry has lost massive amounts of cash on the production of shale gas and has not proven to be profitable in shale liquids. The important number is the 82 bpd for each well in North Dakota. Keep in mind that well production drops off rapidly, depletion runs at 75%-90% per year, and wells cost $5 - $7 million each. Clearly the math does not work, which is why all the conference calls seem to mention negative cash flows, asset sales, and funding gaps. Yes. He has provided a great excuse for the shale industry. 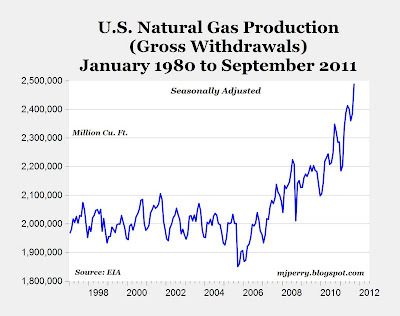 It can't make a buck on natural gas production so to keep the hype going it needs to have people think that once Obama is out of office the laws of nature will be repealed by Congress. Do any of those charts show how gas wells contaminate the enviroment? The U.S. is forced to employ more resources for commodities that required fewer resources before. Advances in technology alone will not replace oil depletion fast enough. Even adding slower economic growth and slower population growth, world oil production will likely fall over the next 10 years. We'll need to run much faster just to stay in place, which the charts are beginning to reflect. Contamination is not the big problem because most incidents have to do with surface damage done by containment issues of used frac fluids. That is an easy issue to deal with. Methane has been leaking in wells and through fractures ever since the methane started to form. By drilling and producing gas the energy companies reduce pressures within formations and actually reduce the methane leaks through those fractures over the long term. The problem is economics. Shale gas does not work at anywhere near the current market prices and cannot work even if prices doubled. The hype cannot be justified by sound economic analysis. Which means that most of the shale gas players will be bankrupt or have to sell off their 'assets' over the next few years. Even though hundreds of billions were invested in exploration and development the production of light sweet is still lower today than it was in 2005. While unconventional crude sources and biofuels can make up the shortfall they are not as useful when it comes to end product production and to say even you need to replace each barrel of sweet crude with more than a barrel of heavy sour or unconventional oil. This is something that the optimists and propagandists fail to mention. The important number is the per well production rate. You can't make up the shortfalls in conventional depletion by drilling $5 million wells that produce an average of 90 bpd in their second or third year of operation. The IMF said infrastructure constraints were likely to prevent Iraq from boosting production from 2.5 million barrels a day now to its goal of 13 million barrels a day by 2017. Crude oil production capacity in Iraq is set to increase by 1.87 million barrels per day (mb/d) between 2010 and 2016, according to the International Energy Agency’s latest Oil Market Report (OMR). And if you're concerned about costs, I've explained before how the "world order" is structured to where the U.S. can consume up to $800 billion a year more than produce in exchange for U.S. military protection. "It has a much lower EROEI (energy return on energy invested) ratio than conventional oil and the production follows a very quick depletion curve. As long as oil is at or near $100 a barrel these field can produce...for now, but at $100 our economy struggles to grow." The Chevy Volt is considered a dud, but that is only because oil is so cheap. At $6 a gallon, people will buy the Volt." As I pointed out above, it is not about the technology, but the price. Craig is probably correct,the fastest way for Obama to propmote alternative energy, is to drill baby drill, until the alternative energy is the only energy. OTH, the presient has to balance many priorities, jumping on his back for each and every call he makes that you disagree with is pretty much a cheap shot: no president will ever do everything just the way you would like. "Even adding slower economic growth and slower population growth, world oil production will likely fall over the next 10 years." I believe that is called a self fulfilling prophecy. Let's not confuse lower oil production with lower energy production. At what point do the energy costs of wind and solar production turn favorable compared to the energy costs of alternative oil and gas production? 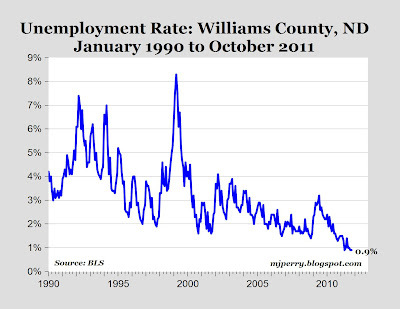 I am curious if there is any policy change or law that caused the reversal of the decreasing trend in the 1985 time frame. dmacp says: "I am curious if there is any policy change or law that caused the reversal of the decreasing trend in the 1985 time frame." 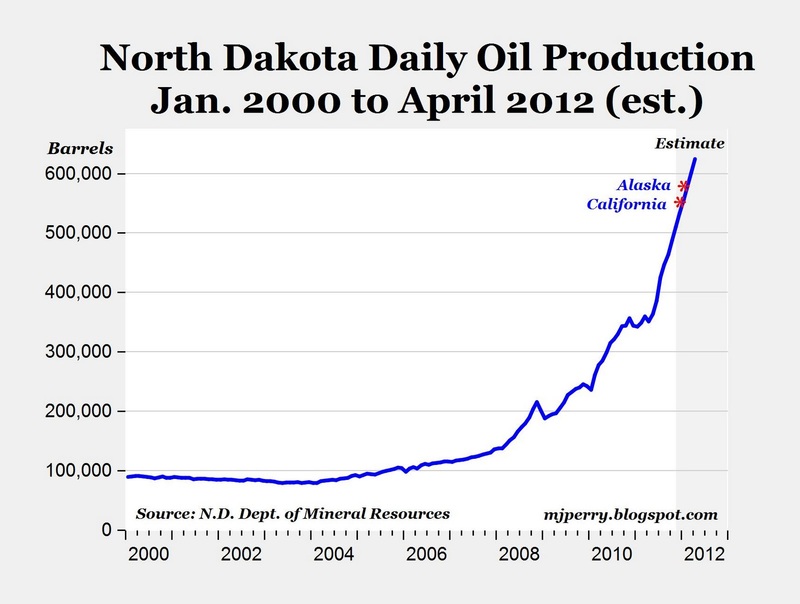 It was likely an increase in oil production, e.g. from OPEC, and an increase in oil consumption from faster U.S. and global economic growth. The U.S. economy became "lighter," on the production side, although "heavier" on the consumption side. 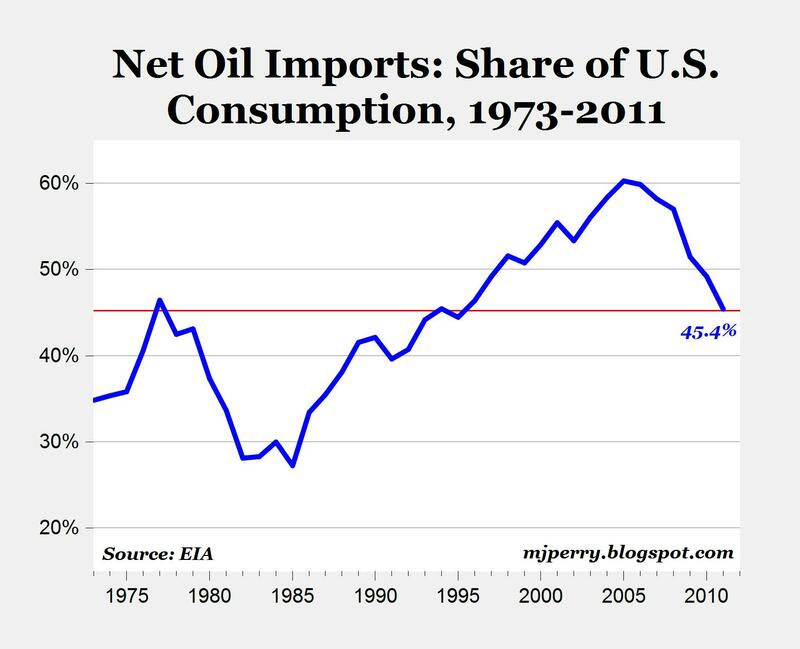 I believe, the U.S. uses 45% of oil just for gasoline. "At what point do the energy costs of wind and solar production turn favorable compared to the energy costs of alternative oil and gas production?" with current tech, you'd need oil to be at least $300/bbl, coal up 500% and gas prices to go up by about 800%, and that's just to get anywhere near parity. maintenance has also proven to be far more expensive than predicted. the numbers put forward by would be wind power producers have pretty much all wound up being nonsense and these "projected 2016 levelized costs" are just total fiction. solar is not going to be able to produce baseline power either no matter how cheap it gets unless there is a quantum improvement in storage. night comes every day. big power plants using fossil fuels/nuclear etc cannot just be turned on and off. warming them up takes days. thus, they will always have to run in parallel and make the gains from solar illusory. at best, solar can help with peak demand during AC season. ideas like using solar to pump water into reservoirs and provide hydro at night are simply unrealistic. apart from massively increasing the cost of the installation, you'd lose over half your power to the process through motor inefficiency, evaporation, friction, etc. i know these 2 are green darlings, but neither is (or can be) going to be a big part of the overall grid. solar may wind up having some uses, but wind is a total write off. dmacp, you may want to see "1980s oil glut - Wikipedia" (from 1980-86). that "levelized 2016 cost" study is deeply flawed and has some very aggressive assumptions in it about cost drops in solar, maintenance costs in wind, and production as a % of faceplate for both. the real costs in wind are likely to be over double that. i know less about solar, but wind folks to whom i have spoken find these numbers to be deeply unrealistic. I think chart #6 would be the relative costs of natural gas to oil on a per BTU basis (from Scott Grannis). This shows natural gas 75% less expensive than oil. #2 fuel oil is currently about $3.37 per gallon, and each gallon has 115,000 BTUs, so you need 8.7 gallons for 1 million BTUs That comes out to $29.30. Natural gas is currently about $10 per 1 million BTUs. These amounts are at the retail level. You need about 24 million BTUs to run the average furnace 300 hours per month. (10 hours/day/month at 80,000 BTU input--Michigan January average). That $240 for natural gas and $703.30 for fuel oil. Pick your poison! Freed Iraq? Didn't he have sanctions that killed children in Iraq before he invaded it for WMDs that it never had? Didn't he destroy the Christian community that was protected by Saddam and wind up killing and wounding hundreds of thousands of civilians? Is that what you call freed? If that is what the West wanted all it should have done is to lift the sanctions. Iraq's oil production would have already been 1.87 mbpd higher. And don't you love the precision being used? These are the same idiots who underestimated the depletion rate by more than 50% but are now forecasting production within 0.01 mbpd six years out. Only an idiot would take those numbers at face value. "The Chevy Volt is considered a dud, but that is only because oil is so cheap. At $6 a gallon, people will buy the Volt." Why? Diesel vehicles would still be much cheaper to purchase, maintain, and operate. The "levelized 2016 cost" numbers could be all wrong, but they are being used to make $$$ decisions by a lot of people. Wind and solar educational programs are having their funding cut. Geothermal is still going strong. "Didn't he have sanctions that killed children in Iraq before he invaded it for WMDs that it never had?" Those would be the UN sanctions, not George Bush's sanctions. The same sanctions Saddam manipulated so useful idiots like VangeIV would demand he bet let out of his box. Oh well, at least Vange is apparently no longer making up claims that the US "applauded the death of children." "Didn't he destroy the Christian community that was protected by Saddam and wind up killing and wounding hundreds of thousands of civilians?" The Christians were "protected" in the sense Saddam didn't murder them out of proportion to the rest of the Iraqi people he murdered. And the Christians who were killed were mostly not killed by US soldiers. But VangeIV isn't interested in clarity and truth. I did not ask about the prices. I asked about the energy return on energy invested. Regards wind power. My boat rule is that I have to sail it enough to keep the cost below $2 per mile. You have to sail a lot to meet that mark, so wind power is not cheap. Then again, power boats are even worse. A note to your webmaster: when I link your blog to facebook I get a quote from one of the comments misrepresenting the tenor of the blog. Please fix. I'd rather have a quote representative of the blog, rather than a commenter. The term "turn favorable" was unclear, but it means how much I have to pay to me. I don't have a sailboat. The UN doesn't do sanctions that the US does not approve of because it could veto any proposal. Those sanctions killed more than half a million Iraqis while the US cheered. While Saddam was a really bad guy the US managed to kill far more Iraqis than he could have. And the US did applaud the sanctions and the deaths. Lesley Stahl asked: "We have heard that a half million children have died. I mean, that's more children than died in Hiroshima. And, you know, is the price worth it?" Your Secretary of State, Madeleine Albright, answered: "I think this is a very hard choice, but the price--we think the price is worth it." And the American press and voters cheered. There were no protests in the street calling for her removal and for the deaths to stop. Nobody cared. No. They were protected in the sense that Saddam was a secular leader who did not allow persecution of Christians by the Islamic majority. Once he was gone the Iraqi Christian society, one of the oldest in the Middle East, was wiped out. I never said that they were killed by US soldiers. I said that the Christians were wiped out (meaning that they were forced to flee to Syria, Egypt, and Lebanon) because of the invasion that was based on lies. Actions have consequences even if you do not like to face them. But those prices only work if the cost side stays the same. You know that it won't because of the energy component on the cost side. When the energy return on the energy invested is negative the alternatives will always be a step short of profitability. VangelV, sure, FDR was responsible for so many German deaths too. Saddam killed millions of Arabs, including using WMDs on them. "As a result of these repeated violations, US Secretary of State Madeleine Albright, US Secretary of Defense William Cohen, and US National Security Advisor Sandy Berger held an international town hall meeting to discuss possible war with Iraq, which seemed to have little public support. In October 1998, U.S. President Bill Clinton signed the Iraq Liberation Act, calling for "regime change" in Iraq, and initiated Operation Desert Fox." VangelV says: "There were no protests in the street calling for her removal (Madeleine Albright) and for the deaths to stop." It's quite amazing VangeIV would rather see a U.S. Secretary of State removed than a brutal dictator. The sooner Saddam would've been removed, the better off the Iraqi people would've been. People like VangeIV just slow the inevitable and make things worse. 2011 peer-reviewed study found, on average, methane concentrations 17 times above normal in samples taken from water wells near shale gas drilling sites employing hydraulic fracturing. Water samples from 68 private water wells in the states of Pennsylvania and New York were tested and some were found to have extremely high concentrations of methane: 64 milligrams of methane per liter of drinking water, compared with a normal level of one milligram or lower. According to one of the authors of the study, "That sort of concentration is up at a level where people worry about an explosion hazard." The average concentration of methane in the water wells near drilling sites lies within a range that, according to the U.S. Department of the Interior, is dangerous and requires urgent "hazard mitigation" action. The research was conducted by scientists at Duke University and what they found was that "levels of flammable methane gas in drinking water wells increased to dangerous levels when those water supplies were close to natural gas wells. They also found that the type of gas detected at high levels in the water was the same type of gas that energy companies were extracting from thousands of feet underground, strongly implying that the gas may be seeping underground through natural or manmade faults and fractures, or coming from cracks in the well structure itself ". Methane contamination has been a common complaint among people who live near natural gas drilling areas. In 2009, a Propublica investigation revealed that methane contamination is widespread, "methane related to the natural gas industry has contaminated water wells in at least seven Pennsylvania counties since 2004". Because of this contamination, several homes have blown up after gas seeped into their water supplies; there have been reports of house explosions in Pennsylvania and Ohio. In one case in 2004, a methane leak caused an explosion that killed a couple and their 17 month old grandson. A study published in May 2011 concluded that fracking has seriously contaminated shallow groundwater supplies in northeast Pennsylvania with flammable methane. However the study does not discuss how pervasive such contamination might be in other areas where drilling for shale gas has taken place. Don, high methane levels vs. normal were also present before any fracking took place. That is why they drilled for gas there. And American deaths. Without Churchill and FDR WWII would have been a war between Hitler and Stalin. No. He used poison gas that his US backers gave him. And as usual, you confuse Persians and Kurds with Arabs. And still exaggerate about your man, Saddam. The removal of Saddam was the business of Iraqis. The removal of Albright and Clinton was the business of Americans. Most stood aside while millions of children died because of the crimes committed in their name. The few who had the courage to stand aside and complain were labelled as unAmerican by the warfare/welfare parties. Do you forget that he was your man? That your government supported the Baathists? Wouldn't it have made more sense not to put him in power against the wishes of the Iraqi people in the first place. No. People like me warn you about the stupidity of meddling that leads to blowback. To us it makes no sense to support al Qaeda in Libya and Syria and to let it get poison gas, surface-to-air missiles, and other sophisticated weapons systems. What happens when some terrorist uses some of the weapons that your government ensured that they acquire to bring down an American airliner? Will you demand that we invade the new Syrian or Libyan regime? The way I see it your ideology blinds you to the lessons of history. Either that or you are incapable of rational thought on the issue. According to which credible source did you get this number vangeIV? The problem is that the EPA ignores the fact that when it is compared to coal, the 'footprint' of shale gas is about a fifth to a third higher. That is true. You expect the drillers to target areas that have high methane levels. This is why most resource companies do a baseline analysis before they do any production. If arsenic is found in the water after drilling it does not mean that it was not there before the drilling began. But the environmentalists and regulators are good at ignoring such analysis because it does not support their narrative. The US government did not deny the number. It just said that the deaths were worth it. The 'tally' includes a war that your government encouraged and supported. It also includes many Iraqis killed by NATO and UN forces as they were retreating during the First Gulf War. You could try to be a bit more credible.